My views and reflections are my own and should be kept in this context. I only speak for myself and from my experience at TFA Oklahoma Regional Institute training in 2015. Went in to my classroom. Great. My partner and I set everything up. The summer rules, expectations, goals, and procedures are ready for our students tomorrow! Very stressful but gotta roll with the punches. Content today was great. I finally learned what tests I am giving and how to give the tests I am administering tomorrow. In order to see the growth of my summer students, I have to give a reading test and a critical thinking tests. We are using F & P reading test (look it up) and critical thinking questions (common core based). I am also giving a spelling test tomorrow. We will see how everything goes. I got to practice how to give my class procedures today in front of my group. It was much-needed. Easy instructions can be so complicated. TFA is giving us the script/lesson plan/ everything that should happen in our classroom for the rest of the week. Also, the lesson plans for 2 days next week. I am glad for that….because #NotAnEducationMajor. First day in the classroom with students. Felt extremely stoic. I felt more alert than anything. I was completely unsure on what I was doing. I felt very awkward. Contemplated quitting. A lot harder than I expected it to be. I had to administer 3 pre-test. I was very unsure of what I was doing. Honestly, giving three pre-test in one day stressed me out because I was a little unsure on how to give them and how to grade them. 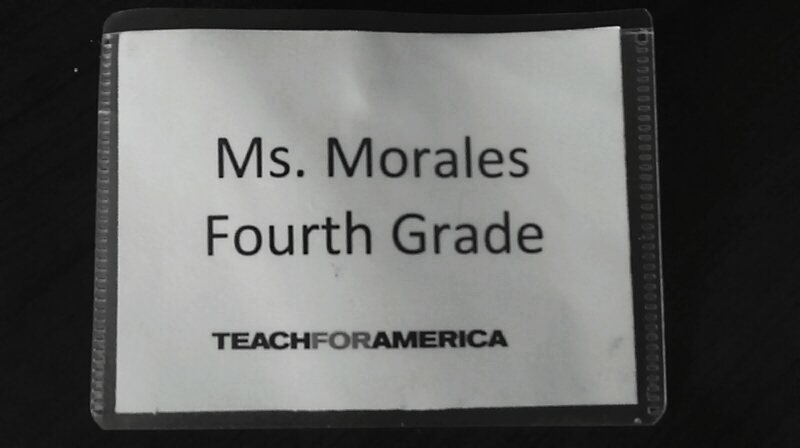 I have to give the pre-test because they are part of the goals TFA has set for each elementary classroom. The first goal is that each student will grow one letter on the F and P reading scale. Second goal is that each student will grow 3 points on the CFQs (a critical thinking writing assessment) rubric. Third and last goal is that each student will grow an individual percentage in their math test. The same math and CFQ pre-test will be given at the end of the summer. A book one level higher than the one the student scored will be given to the student at the end of the summer. All this is to track their progress. We have to use a program called JumpRope OSAT to keep track of all the students grades, attendance, and family contacts. The other two of the test had to be given individually. First pre-test that I had to give was the San Diego Qucik which determines the grade level of reading students are reading. After individually San Diego Quicking everyone, I had to administer the F and P pre-test which is also done individually. Each student gets a different test because it depends on what grade level they read. Basically, F and P tests tell me on what level of reading my student is with reading comprehension. All my students had different grade reading levels. Their ranges were from early 2nd grade to middle 8th grade. I was completely shocked. I did not think there would be a huge gap between the level of reading. I have 33 students on my roster and about 28 showed up. It was intense. I did not finish F and P pre-testing because there was not enough time. Summer school is from 8am until 1pm. In between that we have lunch, bathroom breaks, and dismissal procedures. Maybe 3 or less of the total time that we were at school I was able to administer the pre-test.The rest of the time was spent going over rules, expectations, procedures. I found it extremely tedious to practice forming a straight line and repeating instructions and giving redirections. My colab partner had to give out one math pre-test. Our students had to take 4 pre-test before the day was over. Yea..I was glad when the day was over. There is around 1000 students at my school site for summer school. Needless to say, lunch, recess, and dismissal were all a mess. Also, on this day when I finally got back to my apartment there was TFA higher-ups in my living room. My roommate was crying and said she was done with TFA. I honestly, felt the same way. She decided to resign her position for TFA and went back home. Before my roommate left on June 11 at 5am, we stayed up talking. I told her all the crazy things that had happened during my day. We laughed so much. Laughing with her about all the things that bothered me made me feel a lot better. Obviously, I cannot go into those stories because those are kind of conversations that were brutally honest and without political correctness on TFA training, my school site, and my experience in the classroom. Talking to her helped me debrief because we were on the same page on what was going on. I think my roommate had a good point when she said she resigned because of her mental health/ well-being. Institute is back to back …schedule after schedule..procedure after procedure… 6am to 10pm…all day every day. It is emotionally, psychologically, and physically exhousting. There is no time to bounce back or re-group. This is go go go go go… all the time. ***There is a lot of other people that have quit too. This is no joke. Honestly, I had extreme anxiety of going back into the classroom. Pre-test had to be finished. Also a new pre-test had to be given. The CFQs writting assignment. It was a lot to do. I also had to grade all those pre-test and put them in the tracker online. It was impossible because of time. I had lunch and recess duty on this day. I could not even eat because I felt too overwhelmed to be in charged of 30ish kids. Recess was…… well… interesting. I was hanging out with some of my students and we were playing a game together. I asked them to get in a circle and tell me one thing they liked to do on the weekend. They all started to tell me and then one of my students started bullying another one of my students because her mother was blind. I froze. I did not know how to handle that little incident. All I did was tell me kids that we have to be respectful of people no matter what. I just don’t think they listened. After recess was over it took my class about 15 minutes to get in a line and do it quietly. We had to practice over and over again. After we got back to the classroom, I had to finish up some more pre-testing and get ready for dismissal. Since there is bus riders, walkers, and car riders in my classroom there is a different process on how hey get dismissed. It’s time-consuming. Almost 30 minutes to make sure every student is where they are supposed to be and safe. When all the students finally left, we had a TFA meeting at the school site. By this time it was around 1:45ish. All test scores were due on the tracker by 2:30. Needless to say that was impossible to accomplish considering grading CFQs for 30ish kids is extremely time-consuming. Also, not being done with F and P pre-testing. I felt extremely frustrated because there was no way I could finish that considering time limitations. After our little meeting we had a TFA session about communicating with parents because that same night we had to meet with parents in our classrooms. TFA pushes that we communicate with parents. This is extremely difficult when 95% of my students’ parents speak only Spanish and I am the one that has to do all the communicating to the parents. My colab does not speak Spanish. On top of not being done with all my pre-assesing or putting my data online, now I had to get ready to talk to parents. It was too much. I was exhausted by this point and frustrated. TFA has an expectation that we have to go to 2 of our students houses and do a home visit with them. The point is to know our students beyond the classroom and talk to the parents one on one with more freedom. I do agree with doing home visit. I am looking forward to the home visits to strengthen the relationship with my students. I will be doing home visits with my colab partner next thursday. Going to Tulsa today. Every Friday, we have community day. We explore our fall placement city and learn about the history, community, culture, issues, people, etc. Institute is held in OKC about 1hr and 30 min from Tulsa. I am going to Tulsa with all the corp members that are placed in Tulsa. Excited. The best part of my trip in Tulsa was meeting Ivan who is an organizer for Dream Act Oklahoma. He was a speaker in one of the sessions we had in Tulsa. He shared his story about being undocumented and being able to go to college because of a professor. Also, he talked about being albe to apply for DACA (Defferred Action for Children Arrivals) which is a very mild version of the Dream Act. It allows for undocumented students to be able to apply for a work permit to work legally in the US. In this session we had a great talk about immigration, undocumented students, how to help and be aware. It was great. I have to say it was the highlight of my trip to Tulsa. We also went to other places to learn more about the community in Tulsa. I felt tired. All I wanted to do was rest. We got back from Tulsa around 9pm. I was dead tired. One of my friends rented a car for the day and I tagged along for a road trip back to Tulsa. It was nice because we were in our own schedules and got to look at the apartments that we will be living in. I was able to get a tour of my studio apartment in Downtown Tulsa. I am beyond blessed to be able to live Downtown. I will be leasing a studio in Green Arch apartments. I am looking forward to living in Downtown Tulsa. There is a lot to do. I am excited about that. Today, I have to make a lot of copies. I am feeling a lot better about going into the classroom tomorrow. I have to teach and be ready to present a book to my students. I am going to practice my lesson plan and get ready for teaching now. My favorite part of TFA has been meeting a lof of like-minded people. I will do better and my best next week. Thank you for everyone that has supported me along this journey. So many people who have completed their 2 years with TFA have told me that institute is the hardest part of the program. I can do this! I started this blog sophomore year of college in 2014. My goal is to write one post a month -- about anything! The point is to keep my mind sharp and keep thinking about philosophical issues that matter to me. Sometimes my blogs will feature music and or anything else that I might like at any given moment. I write country lyrics sometimes. I might post them on here for fun.